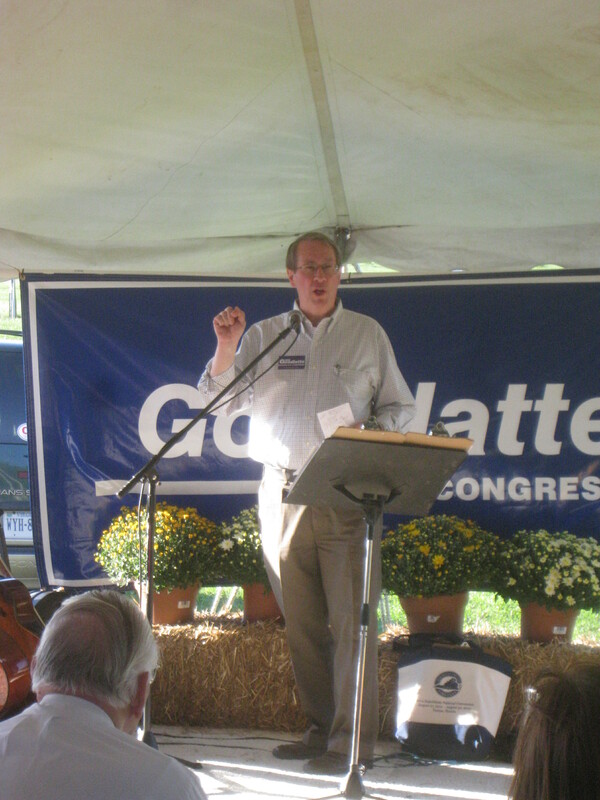 A few moments ago, Representative Bob Goodlatte (VA-6th) concluded his 4th annual BBQ at the Rockingham County Fairgrounds, just south of Harrisonburg, VA. About 400 people were attendance and came from all around the Shenandoah Valley and the 6th district. Besides Rep. Goodlatte, other Virginia officials of note included Wendell Walker, the 6th district Republican chairman who Goodlatte referred to as his boss, Delegate Tony Wilt of Rockingham County, Delegate Dickie Bell of Staunton, Delegate Chris Head of Botetourt, Rockingham/Harrisonburg Sheriff Bryan Hutcheson, Rockingham County Clerk of Court Chaz Evans-Haywood, and the three Republican candidates for Harrisonburg City Council. Lastly, Representative Joe Wilson of South Carolina was also there; he is perhaps best known for shouting, “you lie!” to President Barack Obama during a joint session of Congress back in 2009. Shaffer’s Catering of Woodstock, VA provided the bulk of the food for the BBQ, including the pork and chicken, while many of the attendees brought a variety of desserts. This event serves as another reminder that there is little doubt that the 6th district of Virginia will vote heavily for the Republican slate in November, as it has done for decades. The real question becomes, are residents of the Shenandoah Valley excited and organized enough to offset the liberal trends of places like Charlottesville and Northern Virginia? Given that Election Day is less than two months away, we’ll find out soon.